Headbands have definitely made a comeback this year. They have been in Spring, Summer, and Fall collections, and will certainly be in the Winter collection. Women are in search of ‘the headband’ to make their outfit complete, and many retailers are making sure that they have a variety of the trendiest styles available. Tiaras are more than just a trend. You find them in bridal boutiques, dress shops, accessory stores, and even costume stores. Tiaras are used all year around for weddings, quinceaneras, proms, and costume props. 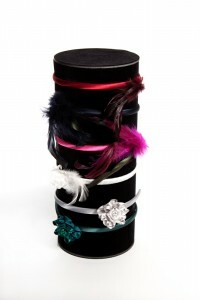 Many fashion retailers are always asking how they can display these colorful headbands and delicate tiaras. Retailers want to know how to make their products stand out while displaying them at the most optimal viewing angle.Â Another concern is always space, many people want to display multiple styles of headbands and tiaras without taking up too much space. Our newest product offers a wonderful solution for retailers. 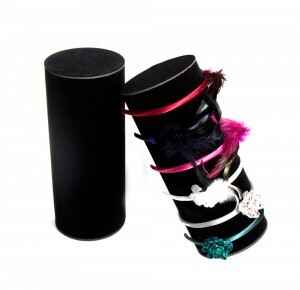 The R-1 Headband display allows retailers to display multiple headbands and tiaras without taking up too much space. The R-1 is made with black velvet and is guaranteed to bring out the color and beauty of any shape, color, or style. Click on images to be directed to the R-1 display on our site!